According to an analysis by Deutsche WindGuard, a total of 1,169 offshore wind turbines with an installed capacity of around 5,387 MW were connected to the grid as of 31.12.2017. According to figures from the industry work group AG Energiebilanzen, wind turbines at sea were able to increase their electricity production to 18.3 TWh in 2017. This is almost 50% more than in the previous year (12.3 TWh). Currently, two offshore wind farms with a capacity of 780 MW are under construction. The final investment decision is available for five projects with a capacity of around 1.5 GW. By 2020, statutory expansion of offshore wind energy up to a capacity of 7.7 GW is possible. Currently around 20,000 employees work in the offshore wind industry with annual sales of around 2 billion euros. That is about 40% of the Europe-wide employed in the offshore wind industry. Although the final production of the plant manufacturers is predominantly located in northern Germany, the supply industry is distributed across all federal states with the focus on North Rhine-Westphalia, Baden-Württemberg and Bavaria. But also many companies in East Germany are important suppliers for the wind industry. The manufacturers and suppliers therefore need a perspective on the utilization of their production capacities in order to maintain and expand industrial workplaces. A sustainably stable home market is the basis for ever-increasing exports of European offshore wind energy technologies. Currently, the wind turbine manufacturers have an export quota of over 70%. And the development continues - manufacturers are working on systems of the 10 MW class and beyond. For this it is important to implement the plans for a test field for prototypes in German waters as soon as possible. "With an output of more than 5.3 GW, wind turbines at sea are increasingly contributing to Germany's security of supply. They deliver clean electricity virtually around the clock every year," said the representatives of German offshore, wind and mechanical engineering associations AGOW, BWE, the OFFSHORE-WINDENERGIE Foundation, VDMA Power Systems and WAB e.V., in a joint press meeting in Berlin, presenting the current expansion figures for offshore wind energy. "The expansion of offshore wind energy is on schedule." However, the reduction of the expansion path of wind energy at sea through the German renewable energy law EEG of 2017 is slowing down this positive development of the offshore wind industry in Germany- especially at the beginning of the 2020s. 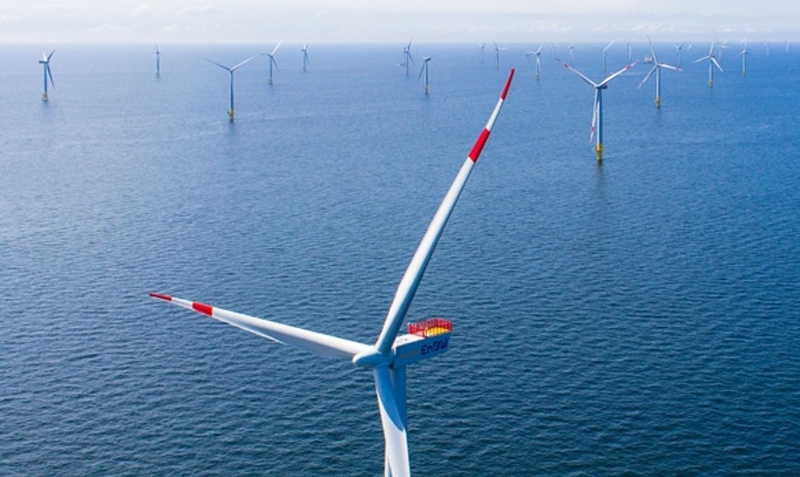 Together with the coastal states and the trade unions, the offshore industry’s joint appeal, the “Cuxhaven Appell” therefore called for an expansion of at least 20 GW by 2030 and 30 GW by 2035 as early as September 2017. Only increased expansion volumes in Germany and throughout Europe will ensure further and lasting cost reductions as well as innovations in technology development. Therefore, also free converter capacities, which will show up after the tender results in Germany in spring 2018, should be used in a timely manner. Also in terms of climate policy, a stronger expansion of renewable energies is necessary. In order to achieve its national and international climate goals, the yet to be built German federal government must create framework conditions that curb emissions-intensive power generation, ensure a higher expansion of renewable energies, and adapt the energy system accordingly. "The new government must set up a binding framework for the energy transition. In doing so, the focus must be on a higher expansion of renewable energies and the corresponding adaptation of the overall system. The exploratory results can open up opportunities here," said industry representatives. "Wind energy at sea can make a significantly larger contribution here than before due to the current cost trend."